DAVID LE/Staff photo. 5/20/15. 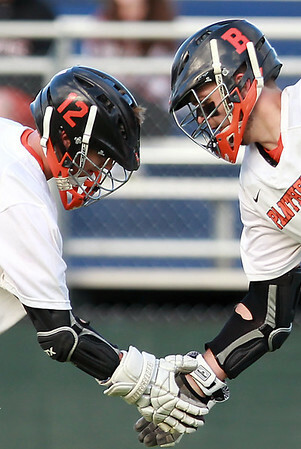 Beverly senior attack Chris Vallette, right, gets a low five from junior teammate Hunter Spencer after Vallette scored. Vallette netted a hat trick to help the Panthers to a 10-8 win over the Chieftans in the North Shore Cup.